"Have you ever thought of yourself as the owner of a corporation? Guess what… you are. If you’re a working musician, a session or touring player, your company is called YOU, Inc. The music industry is the wild west when it comes to the business side of things, so here are some industry tips. Knowing what you have to oﬀer and what it is worth is the first step to creating a sustainable career. The intersection of art and commerce doesn’t have to be tricky. Jimmy Page and Keith Richards are rich. Johnny Thunders and Sid Vicious are dead. Choose your role models wisely. The music business has a wide range of compensation structures depending on who you are and who you’re dealing with. Create a Rate Sheet. What amount of money would you need to show up with a great attitude and feel good about the time you’re going to be putting in? Consider the effort required to fulfill the task as well as travel time, expenses, the amount of preparation needed and so on. Count all the hours and get a realistic idea of what you are making per hour. It can sometimes be eye opening. The most valuable commodity you posses is your time. Add 25% for difficult clients. Ask the more successful musicians in your circle what they charge. When you do this, be objective. This is business. If the coolest dude in the hipster scene rides a bike and lives in a studio apartment, and the big phony sellout lives in the Hollywood Hills and drives a Tesla…. ask the phony in the Tesla. You can be the arbiter of your own integrity. Do not ever confuse that with making money. And don’t let others manipulate you into taking less using that argument. Get paid. Some musicians prefer to ask, “What’s your budget?” and take it from there based on the client’s reply. The other approach is to quote your rate and let the client reply. The first approach can be motivated by the fear of quoting too high and losing the client or the hope that the client will quote much higher than what they would have asked for. For me that’s kind of messy; I like to just quote my rate and let them reply. Also, the Universe has a way of paying you what you feel you’re worth no matter what you say. Either way, use your rate sheet so you have something to work oﬀ of. 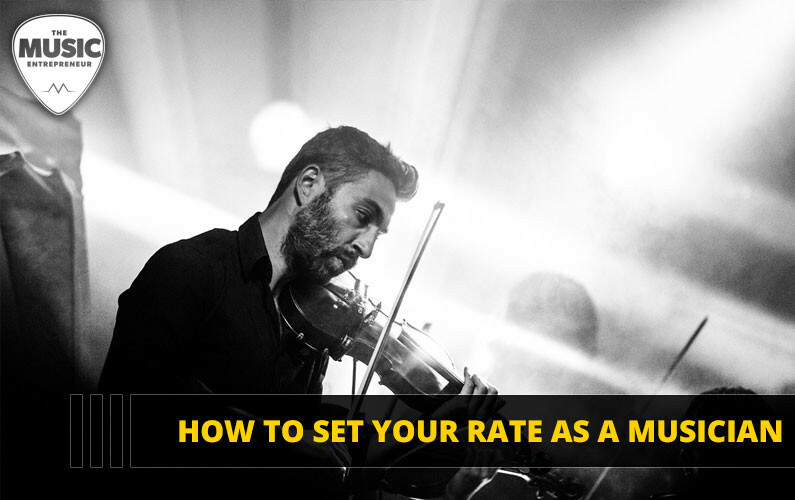 When you quote your rate, either in person or in a message, say it once and end with “thank you”. Do not keep talking or writing, adding a bunch of other words in an attempt to deal with your discomfort. Say it and let them reply. Once you have successfully negotiated and are now working, how does it feel? Are you feeling underpaid, overpaid or is it just about right? The more you work you will see what you like doing and don’t like doing. You can charge more for the jobs you don’t enjoy as much or focus your marketing towards jobs you want to be doing more of. At first, the goal can be to just get paid, but once you are up and running you’ll see that the choice is up to you and that you are creating your career. Use your instincts, but if they tend to be of the under-earning nature then go back to your more successful musician friends and get some input from them. Note: you can talk to the other musicians in the band and go to management as a team, or go it alone. Both options have their good and bad points. Whatever you are doing, ask yourself, “Who would benefit from this?” At the very least it’s a source of inspiration to up-and-coming players, so post it! Reach out to any company that you endorse or would like to endorse––email them, tag them in social media posts along with pics of your gear. Is there an opportunity for the company to be involved with the artist you’re playing with on a bigger level? Making introductions that lead to bigger opportunities is a good thing for all. Think like a business person and think big. Becoming an asset beyond playing your instrument has value and word will get around. So, you just got the gig with Lenny Kravitz and you are getting paid $7,000/week—awesome! But now he decides not to tour for the next two years. What are you going to do for money? Having as many income streams as possible is ideal. You have many talents that you are not aware of or don’t think of as having value. Make a list of 100 things you can do to earn money. Anything, just open your mind up. If you can work at Target, list it. This will get your thoughts ﬂowing and help you come up with some great ideas. It will also increase your network. This process led me to start what has become a very rewarding business as a Career Consultant and Keynote Speaker. Touring is a great way to make a living, but you are trading time for money. To bring in additional money, look at passive income streams such as publishing royalties, writing books and inventions. Ever heard yourself saying, “Man, I wish they made a thing that did XYZ.” Make it! You’re not the only one who has thought that, which means there is a need for it. Creating opportunities that pay you–– literally while you sleep—is a great way to build your income, network and value. Saying “I’m an artist” has been used as an excuse for being lazy, disorganized, broke and drinking too much, more than any other phrase in history. Think of yourself as a business person first. It does not mean you will make inferior music. It just means you’ll get paid for it. Let go of the phony romantic idea that true artists don’t get paid and that if you do ask for what your time and talent are worth, you’re not in it for the right reasons. Andy Warhol’s net worth was $220 million at the time of his death. Everyone’s familiar with the starving artist. But you must take a close look at what they did to understand why they were starving to begin with. Some of them separated themselves from society. Others did no marketing or promotion work whatsoever. Does that describe you? If not, you have the opportunity to be more than a starving artist, so don’t buy into what you’ve heard. Subscribe to the The New Music Industry Podcast on iTunes for more great content." +How To Be A Pro By Joining A P.R.O.